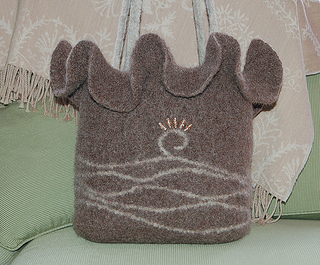 Add a little whimsy to your next felted project by “ruffling” the edge of this charming tote, and adding the optional flirtation of beads and top stitching - stitch guide included. This unusual bag is easy to accomplish with DK weight wool and the simple double crochet stitch. Complete felting instructions are included with the pattern. Well equipped on the inside, it has a large pocket, a place for your cell phone and a key ring holder. When felted, it measures approximately 12” x 12” - not including the ruffle. Its long handles turn it into the perfect shoulder tote for grand occasions or projects that you want to take on the road.